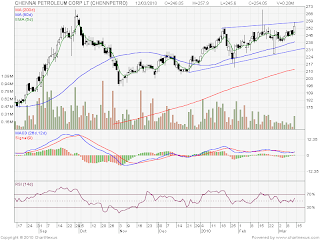 Chennai Petroleum has been consistently making higher lows (as can be seen in the chart above). It was trading in a range for the last few weeks and has made multiple tops between Rs.253-256.50. The stock seems to be breaking out of this range and looks set to head upwards in the days to come.